New garbage/recycling bins have been installed in downtown Winthrop. The first two of at least four new garbage and recycling bins have been installed in downtown Winthrop, replacing the worn-out bins that had been on Riverside Avenue for years. 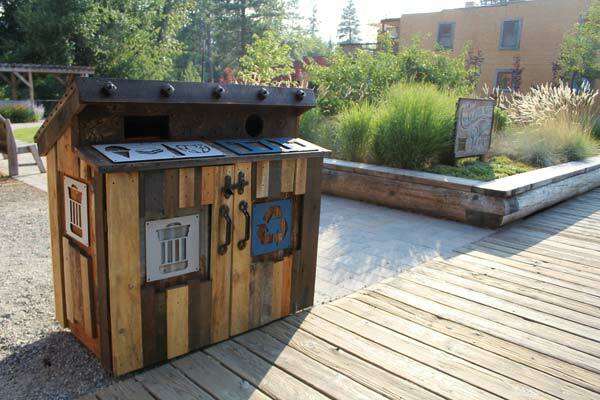 The sturdy, multi-purpose bins are constructed of wood and passed muster with the town’s Westernization code. The bins are a joint project of the Town of Winthrop — which is paying for them and for the regular collection service — Methow Recycles and WasteWise, the local solid waste/recycling collection company. They were constructed by Patrick Hannigan, owner of Nice Nests in Twisp. The new bins are at Confluence Park and in front of the Tenderfoot. They were installed the weekend of the Methow Valley Rhythm and Blues Festival. WasteWise General Manager Casey Bouchard said two more bins will be installed when they are complete — one at the Winthrop Visitor Information Center, and another one at a site yet to be determined. Two more of the garbage/recycling bins are planned for next year, Bouchard said. Designing the bins was a “team effort,” Bouchard said, and Hannigan took the lead on construction. “He knocked it out of the park,” Bouchard said of Hannigan. The rustic-looking bins feature pressure-treated wood, metal bolts, latches and handles, and are designed to provide easy access for collection. Half of each bin is devoted to garbage collection, the other to recycling. The bins look substantial, and they are. Bouchard said he had to recruit extra help to unload and install the first one at Confluence Park.